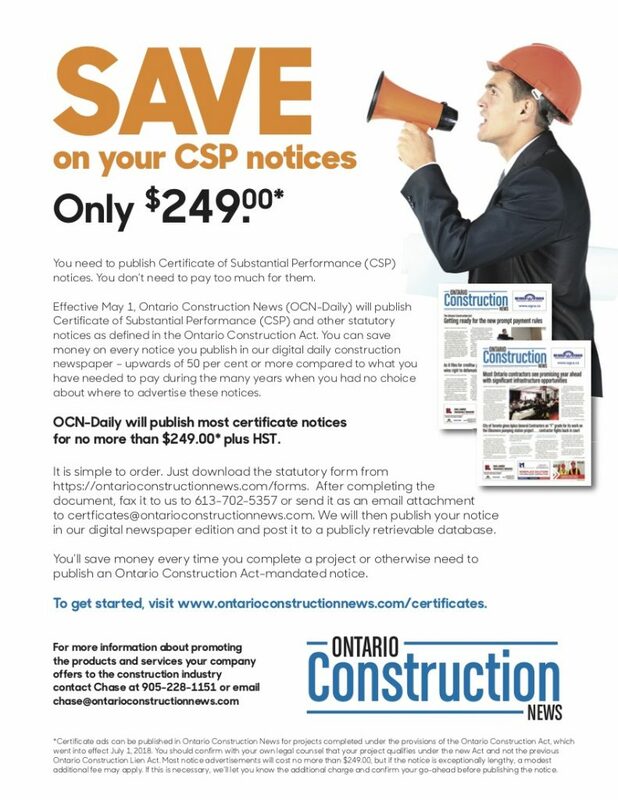 Ontario Construction News will begin accepting Certificate ads on April 24, in time for our May 1 daily publishing launch. ** Price is based on a similar size ad to the one published previously. If you haven’t advertised in the other publication, the $249 offer applies. You can place the certificate and notification advertisements as required by the Ontario Construction Act quickly and economically by following these simple instructions. Download the appropriate standard government form, and complete it accurately. Email it to us at certificates@ontarioconstructionnews.com. You can also fax the form to 613-702-5357. Once we receive the form, we’ll verify and confirm we’ve received it, and send you an initial invoice. We’ll publish your ad/notice in three business days and post it on our searchable notice page. We’ll then send you a copy of the ad with the certificate to confirm the publication date for your records, along with the final invoice. Please check the ad to make sure it is right. While we take care and review the ads before publication, you will want to ensure that everything is correct right away after the advertisement is published. If you have any questions, you can email certificates@ontarioconstructionnews.com or phone us at (888) 627-8717 ext 114. Effective May 1, 2019, 2650547 Ontario Ltd. will publish Ontario Construction News on a daily basis, with the intention that it will serve as a place for construction industry professionals to publish legal notices and certificates. In choosing to advertise here, you acknowledge that it is your sole responsibility to ensure that your project qualifies under the terms and provisions of the new Ontario Construction Act, which went into effect July 1, 2018, and that the project you are advertising is not subject to transitional provisions that would require compliance with the previous Ontario Construction Lien Act. Should you become aware of any errors in your advertisement after it is published, please advise us of the errors and we will use best efforts to provide a corrected insertion in Ontario Construction News at no further cost. For further information, please review our terms of service at www.ontarioconstructionnews.com/termsof, which you agree to accept by making use of any services on this website. Generally the new Ontario Construction Act applies for projects which started or were in the prebid/qualification stage (whichever is earlier) after July 1, 2018. There are other conditions, including special provisions for leaseholds, and you should consult with a qualified lawyer to understand and implement the rules.